This past winter was incredibly mild, the effects of which can be a great bonus to deer hunters. Typically a harsh winter can significantly increase the over-winter herd population. A large number of deer don't survive the winter every year. The other pertinent point is that the majority of the deer population that don't make it through the winter naturally subtracts from the yearly deer population. At some point throughout the year, Wisconsin's deer herd has a much higher population than at the end of the year. The weather ties in with this because the majority of Wisconsin's deer herd mortality rate is attributed to our over-winter months. Many people may not know this but Wisconsin's potentially harsh weather can kill more deer than hunters, car accidents and predators every year. 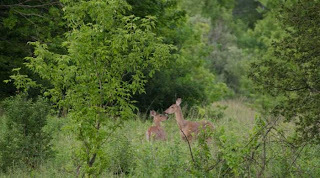 Because the 2011 winter was so mild, it is quite likely that we will see a very large spike in the 2012 deer herd population. How do we prove the 2012 deer population spike? Now, I may not be completely accurate with my numbers but I will attempt to verify it with some sources listed below and do my best to throw out some possibilities. It is important to remember that not all factors and circumstances can be accounted for and results always vary. From my understanding, a healthy pregnant doe is capable of producing up to three yearlings in one year. This means that in optimum circumstances, deer can have enough yearlings every year to increase their population and, yet, by the following spring, the number could be significantly reduced. This means that a deer herd with a size of 1.5 million could possibly have much more than that and then, throughout the year, decrease to the previous population levels or even increase from year to year. Now, in a year where the weather does not get harsh and the over-winter period is rather mild, like this year, it is safe to expect an increase in the deer herd. For me, just watching deer while driving along the highway is enough to attest to an increase. Last week, I drove from Milwaukee, WI to Minocqua, WI and counted over 50 deer in various groups and sizes as well as almost hitting two along the way as they crossed the road. I don't think I've ever seen this many deer so frequently. I hypothesis that 2012 will yield a very large amount of deer relevant to previous years. However, it is important to remember that this does not always translate into a large harvest for hunters. Other factors like warm weather versus cold, fog, wind and rain can effect the two week deer hunting season. Also, hunting methods can also play a role. But all circumstances bearing, I think it's safe to say that we are going to have a good hunting season this year.